Jinan Metro (simplified Chinese: 济南轨道交通; traditional Chinese: 濟南軌道交通; pinyin: Jǐnán guǐdào jiāotōng) is a rapid transit system serving Jinan, the capital of Shandong province, China. Planning of the system began in the early 2000s but was delayed due to 2008 world economic crisis. After years of preparation, construction started at an official ceremony on 29 December 2013. The first line Line 1 (also known as R1) has a total of 11 stations and a length of 26.3 km, and cost CN¥12 billion. It was inaugurated on January 1, 2019, with a 3-month public trial run. The first phase of construction was adopted by National Development and Reform Commission and includes three lines (R1, R2, R3) with 47 stations. The first phase has a total length of 96.5 km, including 72.2 km of underground section, 23.8 km of elevated section, and 0.5 km of transitional section. It is expected to cost up to ¥48.9 bn. 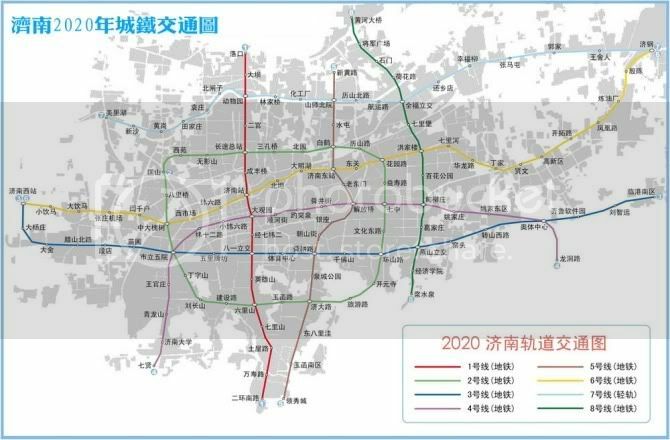 The city's government plans to build eight lines of urban-suburban metro with 262 km length and 154 stations (including 18 interchange stations) in total. 4 lines will run west-east and 3 lines will run north-south. The last one will provide a loop service. The metro uses Alstom/Nanjing Puzhen Rolling Stock Works Metropolis type B six-car rolling stock. The fare system is based on existing smart card technology. Line 1 runs north-south in the western part of the city. It was officially inaugurated on 1 January 2019. ^ 20131229济南新闻 济南轨道交通市域快线建设启动 (in Chinese). Jinan TV (济南电视台). 29 December 2013. ^ "探营轨交1号线|科技内涵颜值 一种范儿"全国头一个"". sd.sina.com.cn. Retrieved 19 March 2019. ^ "济南轨交R2线工程建设启动 王文涛王忠林雷杰看望建设者". news.e23.cn. 26 November 2016. Retrieved 19 March 2019. ^ "济南地铁3号线今年国庆节开通，提前十五个月！". www.sd.xinhuanet.com. Retrieved 19 March 2019. Wikimedia Commons has media related to Jinan Metro. This page was last edited on 17 April 2019, at 15:40 (UTC).